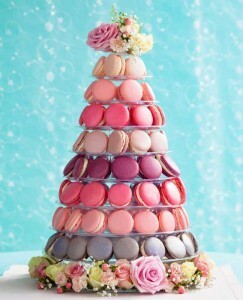 The macaroon tower makes a stunning centerpiece for any celebration such as birthday parties or anniversaries as well as for weddings, and macaroons are still very “trendy” at the moment. We “dressed” our tower in the magazine so it looked more suitable for a wedding, but it can also look stunning when left plain too. I had “fun” experimenting with different recipes to get the best results, and even when I had some disasters at least I learnt from them – and all the “disasters” got eaten in the office. 3. Powder colours are the best to use, and if you want a stronger colour then add some liquid colour. 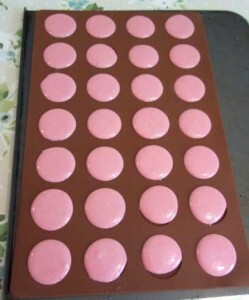 Some paste colours worked, but others caused the surface of the macaroons to crack. 4. I found that the Two Chicks liquid egg white gave the best results, closely followed by using fresh egg white. I didn’t get good results when I tried to use dried egg white. 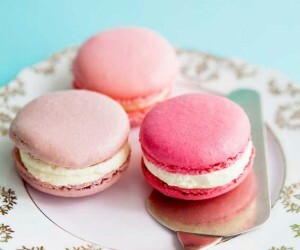 Since writing the article for the magazine, I’ve still been making lots of macaroons as I love eating them, and I’ve found a couple of things that can make it easier. 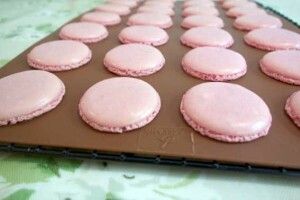 Firstly I’ve been using the Lakeland Silicone Macaroon Mould, which really helps to get them all the same size. It has 28 cavities, so I need 2-3 mats for the quantity of mixture that our recipe makes. I find they come off the mould best when they’ve been left to cool on the mat for a little, so what I do is I slide the mat off the baking sheet onto a wire rack and leave them to cool as that way they cool more quickly than leaving on the hot baking sheet. I found that the best way to make macaroons is to use an “Italian Meringue” method, which is where the sugar is dissolved in water and boiled to 121°C and that is then poured over whisked egg white before the almonds and icing sugar are folded in. This may seem like a long method, and a lot of work, but I found it to give the most consistent results. I’ve done recipes in the past where the egg white is whisked and the other ingredients folded in, but that can be a bit hit and miss. 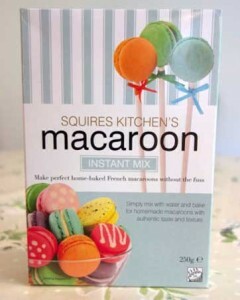 However, if you’re short on time, or don’t want to go to all the trouble, then Squires Kitchen Macaroon Mix will give you good results. The mix just need water adding and whisking for 4 minutes – then it’s ready to colour and pipe – so a lot quicker than making Italian Meringue. The great thing about making lots of these macaroons for a centerpiece is that they do freeze well, so you can make a batch of each colour as you have time, and freeze them. Just make sure they are very well wrapped so they don’t dry out during freezing. Hope you enjoy making them as much as I have – this is one feature where I did come a little obsessed with perfecting the recipe!